Colin Cook, who taught at the King Fahad Academy for18 years, has won his case for unfair dismissal. The tribunal upheld Mr Cook's claim that he was wrongly sacked from his £36,000-a-year post in December 2006 for blowing the whistle to the Edexcel exam board, claiming the school had covered up cheating by children in a GCSE exam. 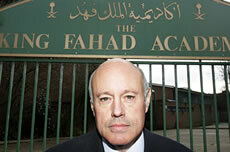 Mr Cook, 58, also alleged the Saudi-funded King Fahad Academy in Acton, west London, preached racial hatred to students. An employment tribunal ruled he had been wrongly dismissed for revealing cheating and awarded him £69,300. However, his claim of racial discrimination was thrown out after the tribunal ruled that Mr Cook, of Feltham, south London, had not been sacked on the basis of his British nationality. Mr Cook claimed the school began investigating him after he blew the whistle on pupils taking notes into English exams. The tribunal judgment read: "The principal reason for the claimant's dismissal was that he had made protected public interest disclosures to his employer and to Edexcel, an examination body." The teacher was sacked in December 2006 and later claimed pupils were taught from textbooks which encouraged racism. Colin Cook told the tribunal: "Subsequent to my dismissal I discovered that race hatred was being taught in textbooks in the school. "My source told me that they were teaching the students that the Christians were pigs. The textbooks asked the children to name the repugnant characteristics of Jews." The head teacher, Dr Sumaya Alyusuf, said she had destroyed the books and the school, which was set up by the government of Saudi Arabia, claimed they were never used in lessons. The final judgment saw Mr Cook awarded £58,800 for loss of earnings and a further £10,500 for injury to his feelings.